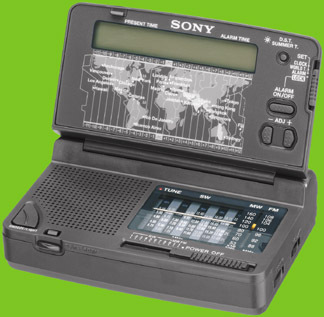 The Sony® ICF-SW12 AM, FM, shortwave analog clock radio was really designed with the traveller in mind. It closes to fit in your smallest pocket. Worldband coverage: 4.75-5.06, 5.9-6.2, 7.1-7.35, 9.4-9.99, 11.6-12.1, 13.57-13.87, 15.1-15.8, 17.48-17.9 and 21.45-21.75 MHz. 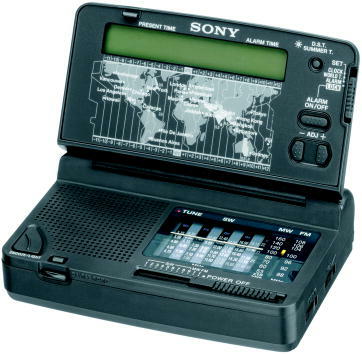 It has a sophisticated backlit LCD world clock display. It wakes you to the buzzer. Antennas include a built-in ferrite bar for AM and a convenient telescopic antenna for FM and shortwave reception. There is an earphone jack on the left side. 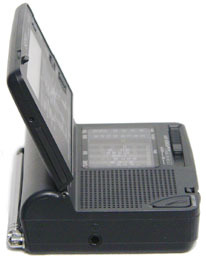 Requires two AA cells (not supplied) and one CR2025 cell for the clock (supplied). 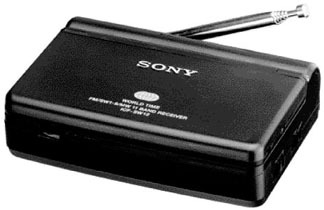 Speaker: 1.75 inches (45mm). 4.38 x 3.13 x 1.2 inches 8 3/16 oz (111x79x30 mm 233g). One year limited warranty. Click here to view larger. Click here to view functions.